As I complete my year of service as the 2014 Maine Teacher of the Year, I am going to add one more voice to those who are reflecting on the past and thinking about the next chapter. Personally, this year has been the experience of a lifetime. I have learned from top educators, as I worked with the State Teachers of the Year from across the country and National Teachers of the Year from the previous decade. I have a broader view of the education landscape and am at once both optimistic and apprehensive. What is ahead for the profession? I am both excited and concerned for the members of the teaching profession. The passion and drive that I witness in my fellow STOYs makes me optimistic about the future, but I also worry. They, too, are tired. They know how to move students and a school forward, but they CANNOT do two full time jobs at once. As the teacher leadership movement gains momentum, and it should, we have to be careful that we are not just turning more and more responsibility over to successful classroom teachers who are already teetering on the edge as they struggle to find balance in a finite day and week. We need to use this opportunity to structure the profession so educators can work with students, meet with parents, plan curriculum, and provide professional development all within a reasonable work day. As teachers we MUST demand a role in the conversation as others decide what is appropriate progress for a student and a school, what student achievement actually looks like and how we can quantify it, and what resources will support a strong public education system in this country. But part of that conversation also needs to include how we can develop a professional landscape that attracts and retains the best without burnout. What is ahead for me? I have just started working with a new group of sixth graders. Tomorrow night they will share the work of their first expedition with their families. It is amazing how far the students have come this fall. These youngsters are beginning to be leaders of their own learning, and I am privileged to work with each one of them. In addition to focusing on my own teaching, I will continue to be committed to teacher voice at all levels. There are several upcoming opportunities that will allow me to bring the classroom perspective to a wider audience. Finally, I am determined to give back to the Maine Teacher of the Year program. 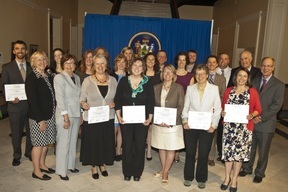 Under the leadership of Educate Maine and Dolly Sullivan, the program was significantly strengthened this year with the selection of 16 County Teachers of the Year. The experiences of teachers from ALL parts of Maine are now represented by these thoughtful educators. As the first Maine Teacher of the Year to observe the County Teacher of the Year selection process, I know firsthand how this shift will support teacher leadership and teacher voice throughout the state. On December 31st, I will call 2015 Maine Teacher of the Year, Jennifer Dorman, and officially “pass the torch.” I know she will be a strong advocate for students and teachers throughout Maine. Then I will start 2015 with a continued commitment to teachers and students. And I will finally sort through my collection of artifacts from this incredible year. Next Sunday I will be narrating a piece at the Portland Symphony Orchestra. The program is called: From Frozen to Firemen. In the promotional materials for the concert, the question is asked: What is your superpower? You may not control snow like Elsa from the movie Frozen, but you might grow up to be a different kind of superhero like a fireman, police officer, doctor or teacher. I have the honor of representing teachers and their superpowers at this event, and this is such a welcome opportunity as my year as the 2014 Maine Teacher of the Year winds down. Teachers are superheroes! They are heroes in life saving ways-literally! Just this week we were unfortunately reminded, yet again, how teachers are sometimes the one person between their students are their personal safety. In Washington State this week, many credited first-year social studies teacher Megan Silberberger as the woman who intervened with the shooter. In typical fashion, she does not want to be called a hero, but she is and we should all certainly refer to her as such. Even during the most “normal” day in a school, teachers are heroes. They educate the students of this nation, in both academic subjects and in traits that will build a successful community. They feed students, by filling their desk drawers full of snacks and making sure students access meals through school and community programs. They clean closets out in their homes and bring coats and boots into the school social worker for distribution. Teachers buy dance tickets for students, purchase equipment that allows a student to participate on a sports team, and send home holiday gifts to needy families. They come in early and stay late, well beyond their contractual obligations, all for their students. Even with all the wonderful work that our educators do, the word I hear most often to describe these amazing community members is humble. Personally, I would like that to change. I want these superheroes to embrace the critical role they play in communities. I want community members to thank educators for supporting their child and working with the family. And most importantly, I want the people in our country who make decisions about education to see teachers as a necessary professional voice and invite them to the table when decisions are made. As I wind up this blog entry and head off to rehearse for my debut at the symphony next week, I want to thank the staff in Senator Angus King’s office for joining the 2014 County Teachers of the Year to talk about national issues related to education and poverty. We felt that you listened and that you appreciated the professional input that these superheroes were able to provide. Finally, thank you to Superintendent Manny Caulk of the Portland Public Schools. When he received an email from a representative from the PSO asking him to represent the teachers of Portland Public Schools and narrate excerpts from the book Oh, the Places You'll Go!, he immediately pointed her towards a teacher in his district. Thank you Senator King and Superintendent Caulk for helping us all take the steps needed to shine a light on these superheroes in our communities! Photos of our meeting with Senator King's staff members: Aisha Woodward, Ben Tucker III, and Edie Smith. 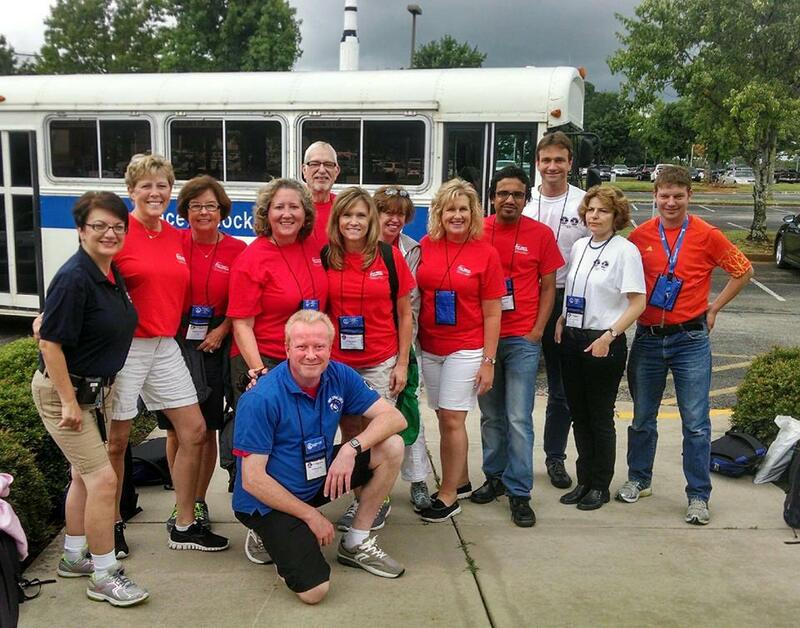 I recently attended my final national conference as Maine’s Teacher of the Year. Next Steps, a conference hosted by ETS and CCSSO was a chance for all of the State Teachers of the Year to process the previous months and think about what is to come. The message was clear. The future is whatever you want it to be. I am not quite sure what that will mean for me, but I know that this year has opened my eyes to the potential that teacher leaders have in the state of Maine, and I hope to help leverage this in some small way. Of course for the class of 2014 the future means announcing the 2015 Teacher of the Year in their state. I spent the month of September and October deeply immersed in this process by visiting the four amazing finalists and sitting in on their final interviews. On October 2nd, during a pristine morning in Skowhegan, Jennifer Dorman was named the 2015 Teacher of the Year. It was such a joyous day for all involved-her students, her colleagues at Skowhegan Middle School, her family and her Maine Teacher of the Year family. Jennifer will be an outstanding representative of teachers and students in the coming year. I look forward to her impact on our profession. The work of bringing teachers’ voices to the forefront continues as the County Teachers of the Year will meet with Aisha Woodward, a legislative assistant for Senator Angus King, who focuses on education, the Senator’s state director, Edie Smith, and King’s regional representative for western Maine, Ben Tucker. We will be talking with them about issues such as college affordability, high -stakes testing, and teacher leadership. As educators, we need to continually push for a voice at the policy level, since so many decisions about education and schools are made without any input from a practicing teacher. On November 15th at the Cross Center in Bangor, the 2014-2015 County Teachers of the Year and the 2015 Maine Teacher of the Year will be officially honored by their families, colleagues, and legacy members of the Maine Teacher of the Year family. It brings the first year of a major change in the MTOY selection process to a successful conclusion. I can’t say enough about the way the process has rolled out this year under the guidance of Dolly Sullivan, the Program Director at Educate Maine. Over 300 teachers in Maine were nominated by someone, 16 County Teachers of the Year were selected for the first time ever, and four finalists made the naming of the 2015 selection daunting for the selection committee. After a whirlwind September and October, I couldn’t be more thankful for Dolly’s commitment to honoring the great teachers in this state. Stay tuned after the first of the year for information on how you can nominate someone. Recognizing outstanding educators is one way we can work to elevate the profession. For those of us fortunate enough to be recognized, we are committed to giving back to this program and to the professional. It is clear that there are many “next steps” to be taken through the end of 2014 AND in the coming year. I look forward to the next steps of my journey with great anticipation. Maine students are in great hands. I've spent the last week visiting the four finalists for the 2015 Maine Teacher of the Year. These skilled educators come from diverse areas of the state and teach at various grade levels, from Pre-K to high school. But they share many qualities: a fierce commitment to their students, an ability to foster strong relationships, a desire to reflect on and refine their practice, and service to their profession. It has been a highlight of my year to visit their schools. All four educators AND their schools represent the best of what Maine's public schools have to offer. Please take the time to get to know these oustanding educators. Skip Crosby is a teacher of Spanish at Poland Regional High School in Poland. He has been teaching for 23.5 year. He holds a Bachelor of Arts in Political Science from Gordon College, Bachelor of Science in Secondary Education from University of Maine, Farmington and a Masters in Spanish from Middlebury College. Skip spent two years at La Universidad Javeriana in Bogota, Colombia, where he earned a certificate in Spanish. Skip graduated from Leavitt Area High School in Turner, ME. Sarah teaches 4th grade students at Cascade Brook School in Farmington. She has held this position since 2012. Prior to that she spent six years as a 5th grade teacher at Belgrade Central School and three years as a 7th grade math and science teacher at Windham Middle School. Sarah holds a Bachelor of Science in Elementary Education from the University of Maine at Farmington and a Master’s in Elementary Literacy Education from the University of Maine. Sarah is a member of the District Teacher Evaluation Team. As a student, Sarah attended Cascade Brook School. Vicki Grotton is the PreK teacher at the Glenburn School. In collaboration with the University of Maine, Mrs. Grotton designed the PreK program and has served as the teacher since its start in 2011. Prior to that she spent nine years as a 6th grade teacher at the Glenburn School. Mrs. Grotton holds a Bachelor’s of Science in Education from the University of Maine and is currently enrolled in the Master’s in Elementary Education program at UM. Vicki is an active volunteer in her community of Glenburn. Mrs. Dorman serves as a Special Education teacher and Reading Interventionist at Skowhegan Area Middle School. She has held this position since 2006. From 1993 to 2006, she was the K-6 Special Education teacher for the district of MSAD 54 instructing students identified with disabilities in the subject areas of Reading, Writing, Spelling and Math. Mrs. Dorman holds a Bachelor of Science in Elementary Education from the University of Maine at Farmington and a Master of Arts in Education from Lesley University. She also serves as a course instructor for the Maine Education Consortium. I have submitted a grant on the website: http://thankamillionteachers.com and need your help. The top grants in the East will be funded with $2500. My grant is for supplies for an after school program that serves students from King and the Parkside neighborhood. I am looking for your help. The directions are listed here. You can vote EVERY day in September. Thanks so much for supporting this. It is the only grant from Maine and we would LOVE to get this funded for our students. 2. In Step 1, write "Macdonald" where it says "Search by last name"
3. Enter your email address and click on "I am over 18 years old." 5. Check email to verify your vote. (Email will be from Farmer's Insurance) Click on red button that says "Verify My Vote". Remember, vote early and often!!!! And, thanks again!!!! The new school year has started. On Tuesday I will greet my class of sixth graders. As a veteran teacher starting her thirty-sixth year of teaching, some of the steps of a school opening can be routine, perhaps too routine. But my energy for the new year couldn't be higher, and I would like to thank the newest members of the profession for this. In my year of service as the 2014 Maine Teacher of the Year I have used the opportunity to break down stereotypes about veteran teachers. We often take a hit in the media for being stale and stubborn. I give a voice to experienced teachers who are innovative and providing highly effective instruction to their students. And since I have worked on a staff which has a very limited turnover in the last decade, I had not recently experienced the passion and zeal of our newest teachers. But this year I will have newer teachers in the classrooms on both sides of me, and I now recognize what they bring to the school, the students, and my career. New teachers focus on the positive. The new math teacher and social studies teacher on my team keep talking to me about all the things we are doing right at this school. As someone who has been there for 24 years, I sometimes focus on all of the changes we are NOT making. These young educators have reminded me that as a school, we have come a LONG way in our journey to help ALL students succeed. They are right. It is a special place for students! New teachers ask questions-a lot of questions. And when they do this, they force the more experienced staff to be reflective. Well let’s see, why are we doing it this way? If we can’t answer that question it might be something to revise for the future. Keep those questions coming! New teachers are ready to listen. They want to hear what veteran teachers have to say about educational issues and classroom practice. We have a lot to offer the new staff members and are happy to share our expertise, our opinions, and our resources. New teachers remind us that teaching is a valued profession. These newest members of our staff spent the summer organizing a resume, filling out applications, and completing interviews. Their goal was to be a teacher at our school! It is an exciting and fulfilling profession and their efforts call to mind our own initial journey into the field. New teachers bring expertise. Remember, these young teachers have been exposed to the most recent research on teaching and learning during their preparation program. They also grew up with technology integrated into all phases of their life. They know apps and programs many of us haven’t even heard of. So, I welcome the newest members of the profession to the field of education and to their schools. Thank you for choosing to teach. You will find your career exciting, challenging, exhilarating, and fulfilling. You not only serve the students in front of you, but you bring positive energy to your colleagues and the profession. We are thrilled that you have joined us! 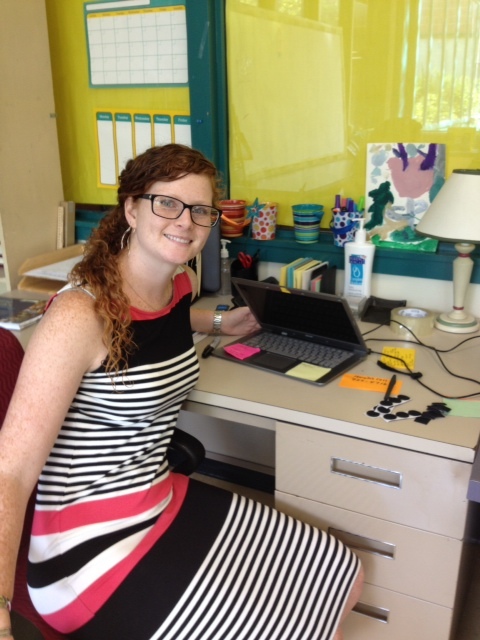 Nicole Casasa-Blouin sits at her desk at Riverton School after setting up her third grade classroom for the start of the year. As a State Teacher of the Year, you receive many special opportunities. One such occasion was the chance to Teach it Forward with a full tuition scholarship from the University of Phoenix. In early May, during our Washington Recognition Week, we received the information needed to nominate someone. Although the timing did not work out for graduating seniors in the high schools of Portland, it did open up the chance to nominate Beth Reed, a dedicated ed tech at King Middle School. Beth has been a steadfast member of my teaching team for the last three years. I often heard her discussing the dream of going back to school, but with a full-time job, a young son, and the cost of higher education these days she was unable to commit-until now. As my nominee for the Teach it Forward scholarship at the University of Phoenix Beth just received word that she has been accepted for the Masters of Arts in Education/Administration and Supervision program. Over the next month the final stages to her enrollment will be completed and she will begin this exciting step in her career. While there are 54 State Teachers of the year, only 30 of the nominees were accepted by the university, so I am especially pleased and proud of Beth Reed. Congratulations are in order and my thanks for all you do for the students of Portland. I anxiously await your stories of this new phase in your education. As a regular Facebook user, I am not immune to trends in social media including the ALS Ice Bucket challenge. On August 16th I was challenged by Dolly Sullivan, the program director for the Maine Teacher of the Year. Of course I accepted, and posted my video on line the next day. Deciding who to challenge was not a problem, and I challenged the Superintendent of the Portland Schools, Manny Caulk, the former PEA President, Kathleen Casasa, and the Connecticut Teacher of the Year to keep the momentum moving. Since the 24 hour “rule” was not strictly enforced on this one, donations to ALS will be made from all of us. Mark you calendars because he Superintendent and Kathleen Casasa will be participating in the Ice Bucket Challenge on the first day of school at 1 pm in front of King. (photos and video will be taken) I appreciate their enthusiasm for the challenge, their understanding of the devastation a diagnosis of ALS brings to families, and their dedication to the children in this district. I have posted my video here, and look forward to a new posting on the Portland Public Schools website once the challenge is complete! I live in St. Louis, Missouri. I am sure that you and the rest of the world have heard about the many issues the people in Ferguson have faced since Saturday, August 9. The children of families in that small community are a part of the large Ferguson Florissant School District. Schools in that district were originally scheduled to open on Thursday, August 14th; but, the violence and very dangerous acts of a few people made it too dangerous for children to travel the streets of that small community, so all of the schools remained closed. On Monday evening, August 18th district officials announced that schools would be closed all week. This news was painful for the children who wanted to go to school. Several children of all ages told local TV reporters how much they wanted to go to school. One high school senior did not get the news and went to school dressed up in a suit because he wanted to start his senior year in a "business like manner". This was when the WONDERFUL teachers in the Ferguson Florissant School District got together, talked with library officials, and set up "schools" in libraries throughout the district for any students who wanted to come. Some students walked and some were brought by parents; but they came! The teachers engaged the students from 11AM to 4PM. It warmed my heart to see children writing, playing learning games, listening to stories, drawing and singing. I need to say that while some of the teachers in those "schools" live within the district, many teachers live in communities near and far. Their hearts directed them to work with the children and prepare them for the start of school. You also need to know that the teachers were not required to be at their schools during those difficult days. They could have stayed at home. Their actions reflect the hearts of all the teachers in our area who have been so concerned about the children in that district. Their actions reflect the hearts of teachers throughout our great nation. I am more than halfway through my year of service as Maine’s Teacher of the Year. I will be forever grateful for this experience. Many people told me that my “life would change” when I received this award, and I was skeptical. How could it change? I was completely committed to returning to my classroom after the year was up. I couldn’t imagine how the experiences this year could change me. But, I have to admit, I don’t know everything. One thing that has made this year incredible is my opportunity to see the future of education in Maine. The Maine Teacher of the Year process evolved this year, and each county in Maine currently has a County Teacher of the Year. They are amazing educators. It has been a highlight of the year to get to know these teachers, hear them address issues related to education, and learn about their passions. This coming week I have the honor of reading eight portfolios as the semi-finalists continue on this journey and put their work forward to be considered as a finalist. I remember how hard I worked last summer to articulate my viewpoints and my experience, and I know the eight of them spent many hours since school ended getting their story down on paper. Meeting young educators makes me so hopeful. I left the oral presentations on July 30th at the University of Maine at Orono completely invigorated. The semi-finalists are all articulate about the challenges facing schools in Maine. They have formed a bond as a group and will support one another as they lead in their county. They handled random questions from the “audience” with ease and sophistication. Maine schools have amazing teachers. Teachers are NOT the problem in education. In fact, as we struggle in our state and our country to make major shifts in our education system, teachers are holding things together. They know their students, their parents, and their schools. Each day they enter their classrooms working hard to make it a successful day and year for each student. No other profession gets input from so many people in this country. Just because we all went to school doesn’t mean we all understand the complexities of teaching and learning. My sincere congratulations and thanks to our eight semi-finalists for their dedication this summer. I am sure that this week they will shift their thinking from preparing for their oral presentations and portfolio to preparing a welcoming classroom for their students. Maine is a great place to live, and our educators need to be celebrated. I, for one, give them a standing ovation.